Every Sabbath, in synagogues around the world, Jews gather to hear the weekly Torah portion read aloud. But is the Bible relevant today? Does it speak to us? In Table Talk, Rabbi Weisblum shows us that it is and that it does. 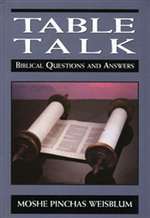 Table Talk is a simple road map for anyone who wants to quickly grasp the meaning and message of the weekly Torah portion.